MUNICH — At five o’clock last Sunday afternoon, Munich time, three Mariinsky Orchestras began to play. Two of them launched into Pikovaya dama and Die Zauberflöte at the Mariinsky complex in St Petersburg. The third, here at the Gasteig, opened the accompaniment to a witty Shchedrin vocalise. Such are the possibilities with a roster of 335 musicians, the world’s largest. At the concert, though, the Mariinsky name was bizarrely buried. “MPhil 360°,” screamed the program book cover, “das Festival der Münchner Philharmoniker,” nowhere mentioning the Russian orchestra. The missing credit no doubt mattered less to Valery Gergiev, who now helms both orchestras (or all four, depending on how you count), than the furthering of his new goals: to better relate the Munich Philharmonic to citizens of all walks of life and to programmatically “bridge … German and Russian orchestra culture.” And in this the first MPhil 360° went far, as a lobby- and hall-based three-day jamboree with interviews and attractively priced music in varied formats. Indeed Gergiev himself went far, conducting as festival climax on Sunday five hour-long, off-subscription concerts centered on the Prokofiev piano concertos. Nine hands of Herbert Schuch, Denis Matsuev, Behzod Abduraimov (pictured), Alexei Volodin and Olli Mustonen partnered him at 11, 1, 3, 5 and 7 o’clock, respectively, while scores by Haydn, Mozart, Weber, Reger, the Munich composers Hartmann and Widmann, besides the Munich-based Shchedrin, offered mostly pertinent, mostly Germanic counterforce. Fortunately for the MPhil’s amenable Intendant, Paul Müller, the extravagant project, at least Sunday’s marathon part of it, proved a logistical and artistic success, even if attendance hovered at 50% of the Gasteig’s capacity. It may or may not have been smart to let the Russians do 60% of the work — assigning them the first two concerts in addition to the five o’clock and leaving less than two hours of music to the day’s titular heroes — but orchestral standards held up throughout as numerous manned Medici TV cameras rolled. As if conducting 300 minutes of music was not enough, Gergiev amiably stood through solo encores and was available for interview during the intermissions. Not incidentally, he dedicated all the concerts to victims of the Islamist murders in Paris. Hearing five pianists emphasized the disparity of the concertos. The scoring of the compact D-flat-Major work (1912) favors the orchestra, which was dazzlingly unchecked in this performance so that Schuch’s fleet playing could not consistently be heard. Volodin’s sparkle and linear integrity in the left-hand Fourth Concerto (1931) could not overcome the perception, in context, of a drop in creativity in the writing; the pianist more fully advertised himself with a blistering account of the Precipitato from Prokofiev’s Sonata No. 7. Mustonen presented the first three movements of the madly insistent Fifth Concerto (1932) as a unit, with its Toccata a backstop on essentially percussive ideas. But he attempted a round open sound for many figures, quite divergent from, say, Ciani or Béroff. His Larghetto and Vivo offered unforced contrast. The concertos from 1921 and 1923 fared best. Although Abduraimov’s light touch demanded cupped hands to the ears, he breezed fluently through Concerto No. 3, finding playfulness in its angularity, nonchalance in its lyricism. His reading had a crystalline quality underpinned by decisive, shapely phrasing in the left hand, qualities that rendered uncommon detail in the Variations. To the G-Minor Second Concerto, summit of Prokofiev’s work in this form, Matsuev brought power and evident consideration of its 32-minute arc. 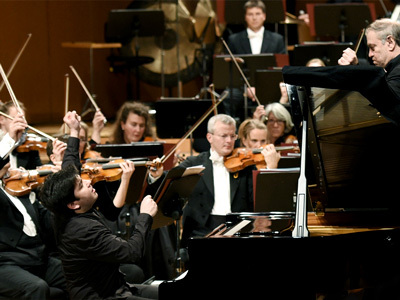 Robust rhythms, neatly accented quiet passages, a frame to justly billet the big cadenza, flashes of droll humor in the Intermezzo — and the pianist barely glanced at Gergiev, who took his cues where he could. As encore came Rachmaninoff’s picture etude The Sea and the Gulls, equally intense and played with command of the long line. If support from the podium in the concertos wasn’t always sensitive, repertory choices elsewhere mostly played to Gergiev’s strengths. The day got off to an alert start with a technically fine performance of Prokofiev’s First Symphony (1917) from the Mariinsky Orchestra. Next came a real Classical symphony, Haydn’s Bear (1786), but this lacked elegance and, consequently, expressiveness. Weber’s Romanticism bookended the second concert and concerto. His Freischütz Overture (1821) benefitted from the maestro’s energy shots at vital moments; the 1841 Berlioz arrangement of his Invitation to the Dance shimmered transparently. When the MPhil showed up at three o’clock, a closer rapport was apparent between conductor and players (versus two years ago). Reger’s harmonically alluring Vier Tondichtungen nach Böcklin (1913) showcased first the strings (in an Elgarian picture with chances for the concertmaster), then the refined winds, next the whole orchestra (in the duly macabre third tone poem, Die Toteninsel), and finally Munich’s percussion section (in an exuberant bacchanal colorfully scored). Two hours later the Mariinsky musicians were back, still on superb form, for that vocalise, the episodic and folksy Tanya-Katya (2002) with creamy-toned lyric soprano Pelageya Kurennaya; Hartmann’s Suite from Simplicius Simplicissimus, assembled in 1957 from the revised version of his 1935 opera, in a lively, at times jazzy mix of styles relished especially by the principal trombone; the concerto with Volodin; and, wrapping up a long haul for them, Naughty Limericks, the gaudy 1963 Shchedrin piece, which poorly followed the Prokofiev but was loudly applauded in the presence of the elderly composer, a friend of Gergiev’s. The MPhil’s second concert began with Jörg Widmann’s raucous concert overture Con brio (2008), again unhelpfully programmed with Prokofiev. The composer-clarinetist then played, or rather milked, Mozart’s A-Major Concerto, K622, jumping about the stage like an excited six-year-old, before Mustonen walked on to conclude this engrossing, unrepeatable venture. This entry was posted on Sunday, November 22nd, 2015 at 2:10 pm	and is filed under Munich Times. You can follow any responses to this entry through the RSS 2.0 feed. Both comments and pings are currently closed.